The Chhau dance is a genre of martial dance performed by tribals in the states of West Bengal, Orissa and Jharkhand. 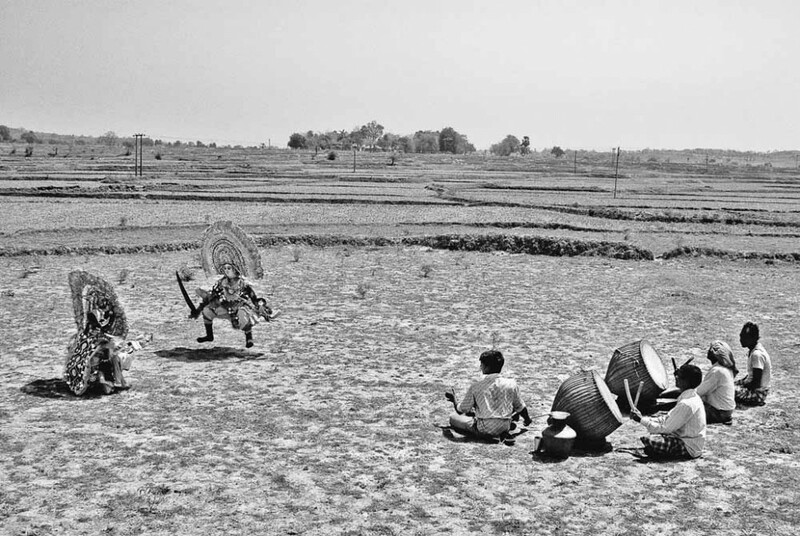 Based on place of origin and development, this dance can be classified in three subgenres—Seraikella Chhau, Mayurbhanj Chhau, and Purulia Chhau. The Purulia Chhau and Seraikella Chhau are more popular than Mayurbhanj because of their vigour. The major difference among the three is regarding the use of masks. 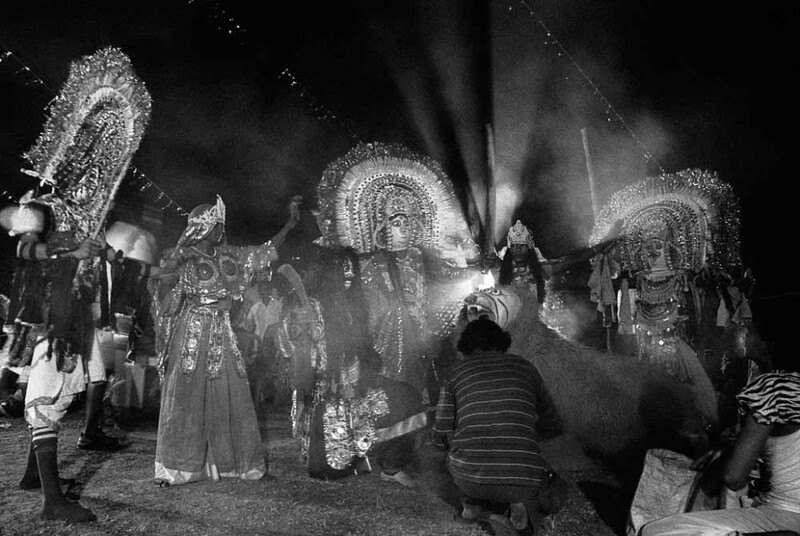 While Seraikella and Purulia use masks, Mayurbhanj Chhau does not. The Seraikella’s technique and repertoire were developed by the erstwhile nobility of this region who both performed it and choreographed it. 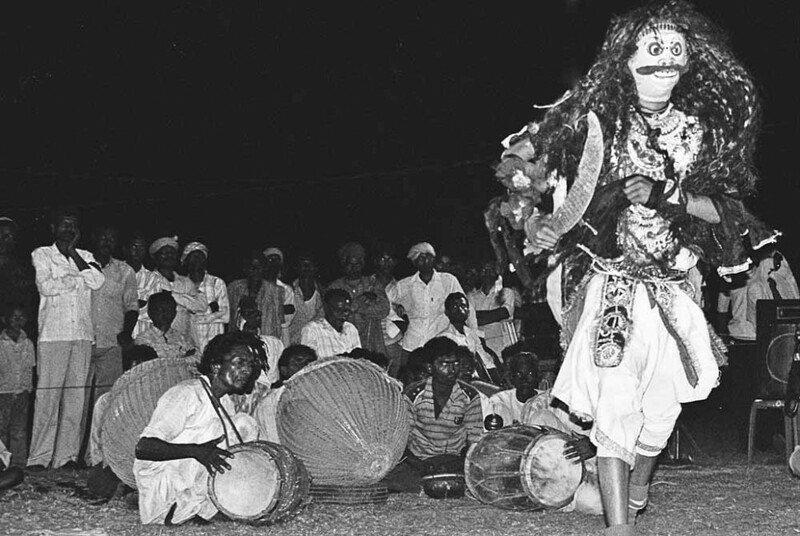 The Mayurbhanj Chhau is performed without masks and is technically similar to Seraikella. Purulia Chhau too uses masks, and in addition it exhibits the spontaneity of folk art. This is because, unlike Seraikella and Mayurbhanj, which enjoyed royal patronage, Purulia Chhau was sustained and developed by the people themselves. There are a number of explanations for the derivation of the name “Chhau”. The word is believed by certain people to come from the Sanskrit root “Chhaya”, meaning shadow. As masks are an integral feature of this dance, it is thence called “Chhau”, which means mask. Some people believe it is derived from the local word “chho” which means expressing or doing something with gestures. Another explanation is that long ago this dance was performed by the military of the local kingdom in their leisure time. The themes included their heroic deeds and traditional folklore. They performed this dance for their own entertainment as well as to encourage themselves. 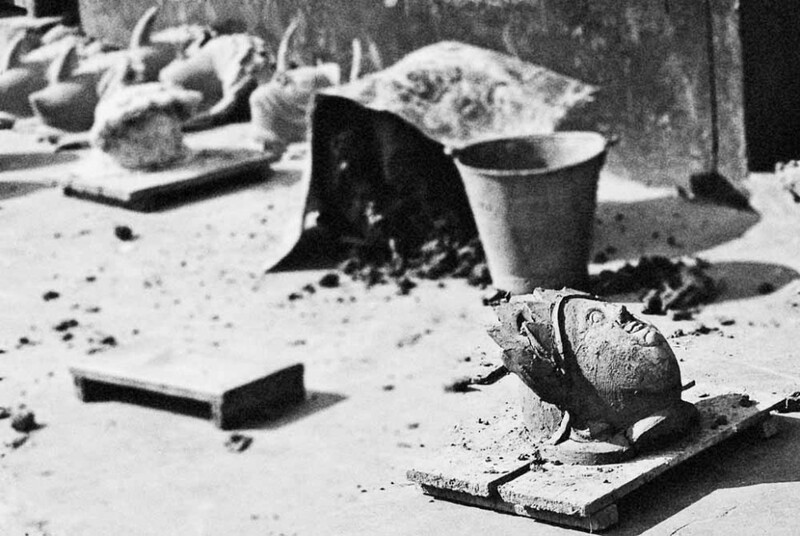 As it was performed in their camps (locally known as “Chhauni”), the name “Chhau” came from that term. Chhau is performed mainly in the Spring Festival, “Chaitra Porob” which lasts for about 13 days, but serious practice goes on through the year. Tribal men are the performers of this martial dance, mostly from the families of traditional artistes or from local communities. The most notable feature of the genre is the dresses and masks. Some villages are completely dedicated to the task. Here, almost every person is an expert on the making of masks and dresses. Children are trained in the forms of the dance from a young age. Chhau involves a display of physical skills, exercise and immense ly hard work. It is mainly performed at night in an open space, called “akhada” or “asor” along with traditional and folk music on the reed pipes “mohuri” and “shehnai” (locally shaina). A variety of traditional drums provide the percussion. These are the “dhol” (a cylindrical drum), “dhumsa” (a large kettle drum) and “kharka”. The themes are based on folklore and episodes from the Ramayana and Mahabharata. 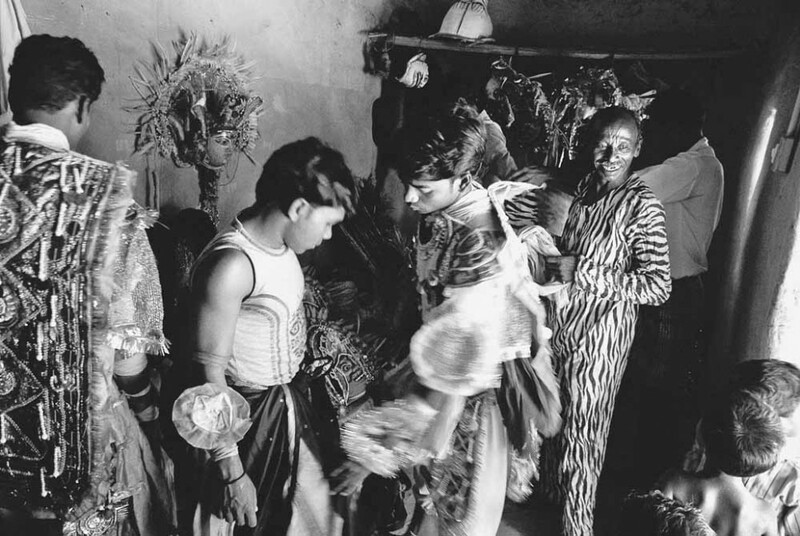 Besides its importance to culture, Chhau is crucial to the local economy. There is a global audience for this folk art form, and a large number of families earn their livelihood by performing and selling masks and dresses. 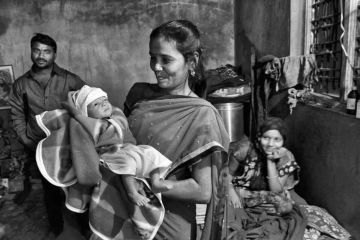 But the future does not look bright, as a lack of care, an absence of planning for the business of Chhau and government apathy threaten its growth. 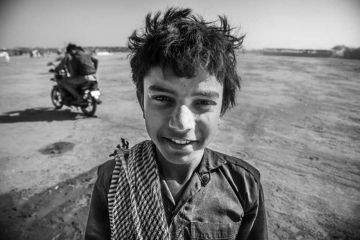 Fewer young people are willing to take up Chhau given the financial uncertainties that surround it. They prefer to look for jobs that don’t have so much uncertainty. The only way to ensure the long-term future of this art would be to make those involved in it financially secure. 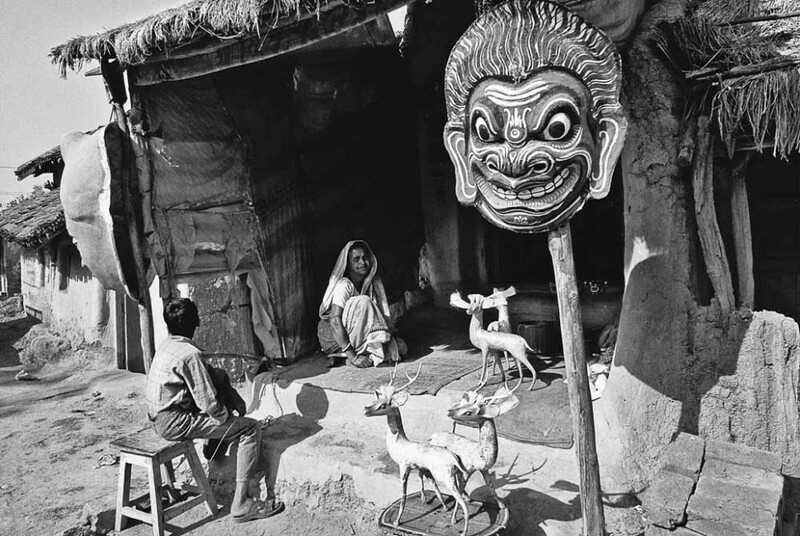 A woman selling a Chhau mask at a shop in Charida village, Purulia, near Bagmundi and the Ajodhya hills. 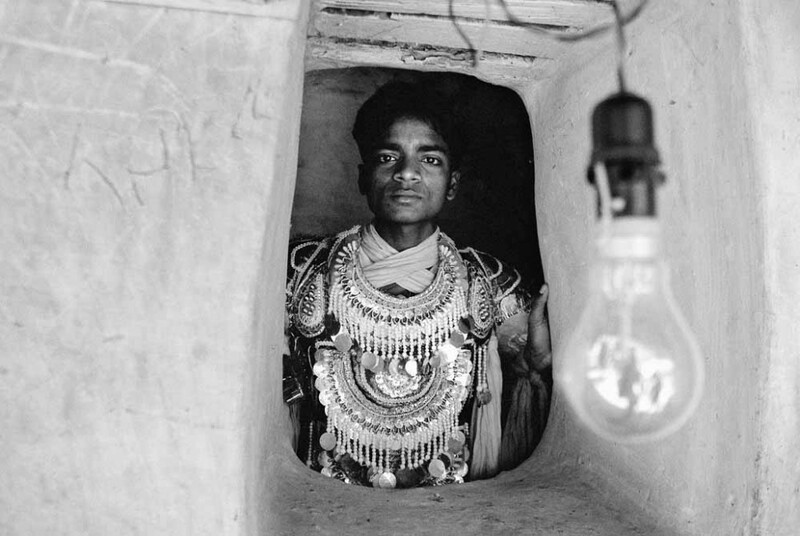 Most of the villagers are dependent on Chhau for their livelihood. Work in progress; masks drying in the sun before the colouring begins. 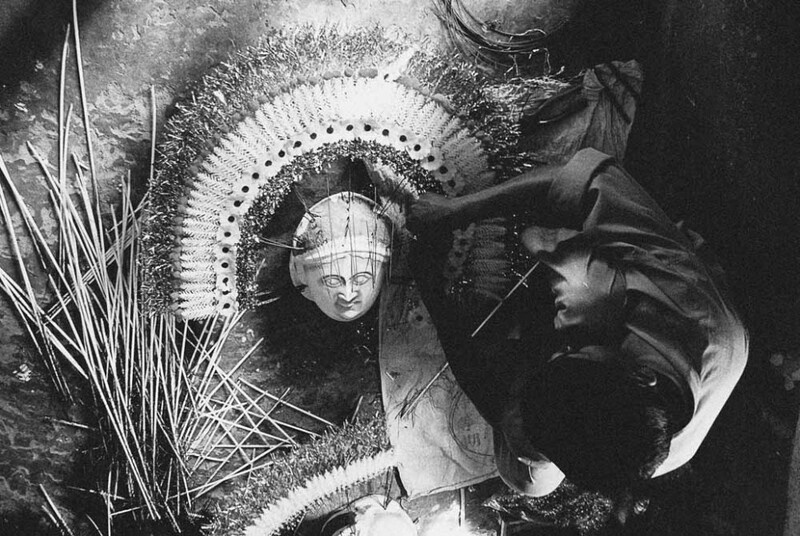 A craftsman working on a Chhau mask. The mask-makers, who are Sutradhars or wood-carvers by caste, are located in two or three centres in Purulia (mainly in Charida) and practically originated from one centre. They were also known as Dutta and Seal. 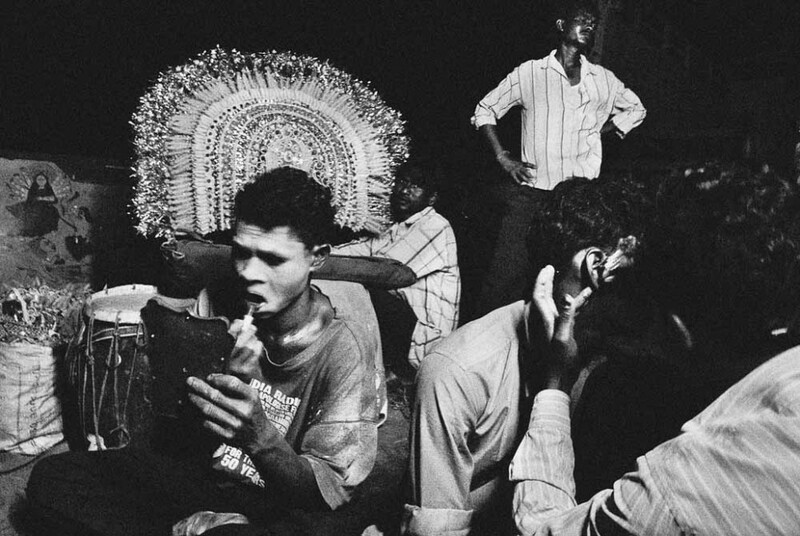 Their livelihood depend entirely on the Purulia Chhau found only in west Bengal. A group of Chhau dancers before the performance. The elaborate costumes means that that it takes a group an hour or two before they are ready for the show. Chhau calls for great athleticism as it is a martial dance that employs mock combat techniques, stylised gaits of birds and animals and the movements of daily chores that women perform. 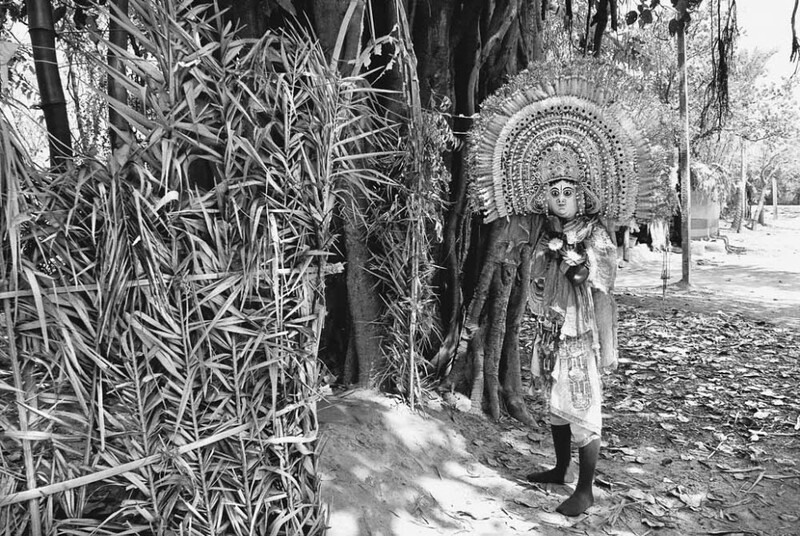 A Chhau dancer waits for the show to begin after worshipping the local deity. 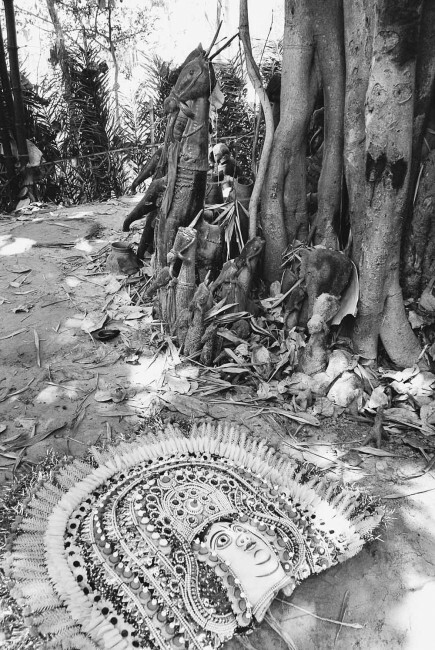 A mask lies before the shrine for the inaugural dedication. The orchestra watches the performers practice in the fields after harvest. It's time for the powder and paint to come on as showtime get closer. 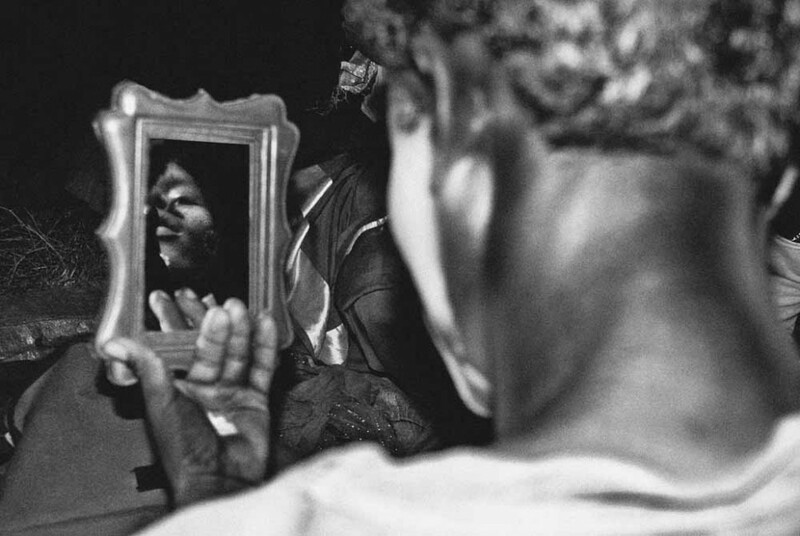 The artistes have to do their own make-up as there are no dressers for the job. The themes are mainly based on folklore and the Ramayana and Mahabharata. Here the performers are doing Mahishasur Mardini. A young dancer sitting alone after his performance. He was brilliant on stage but he is not optimistic about a career in this art. The money is not enough for a normal life. 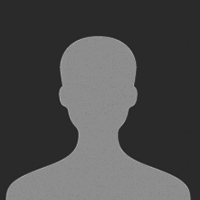 is a painter and photographer based in Kolkata. 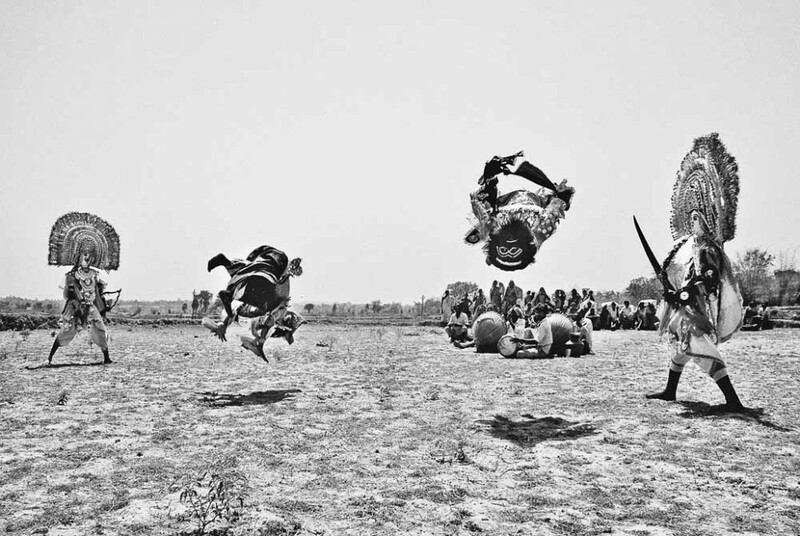 The Maaldharis take part in their annual games in the Banni grasslands. 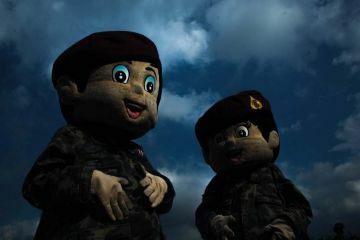 Mythology and military in Thailand.